Introducing the BigRigTravels FAQ Page. I started off with a few most common questions, but I will let you submit your own questions so we can populate this database for you. Open and close the questions using the arrow. You can search for an existing question, or you can submit your own. I will answer your questions as soon as I can and they will post here on this page once I answer. Make sure you rate each question for me! Over time, I will make this the most comprehensive and detailed FAQ complete with images and videos as required. Enjoy! What are you currently hauling? I never disclose what my current freight is. This is for security and liability issues. I can say 85% of the time I haul food and it can be refrigerated or dry food. I also regularly haul non food items. If you can buy it in the grocery, department, or hardware stores I have hauled it. I have even hauled some “different things” that I you personally would never think about. Do you only get paid driving hours? Any pay when you have to wait for loading/unloading? I get paid by the mile. Basically, that would mean I do not get paid to do inspections, washouts, fueling, checking in and signing bills at pickups and deliveries, sitting in traffic, etc. I DO get paid if I am ready for dispatch but no trips are available so I end up sitting waiting for a load. I get paid detention pay while in customer docks after the first two hours past my appointment time. I do get breakdown pay for every 24 hour period my truck is in the shop. Sometimes I may get shorthaul pay for the trips that are less than 100 miles or so. Do you ever get assigned to a load to or from Canada? What does the abbreviation O-O mean? Owner – Operator. A trucker that owns his own business, truck, and sometimes trailer. He may contract for another company or he may be entirely on his own booking his own freight contracts, etc. Deadhead means that I am going from the last delivery (where I emptied my trailer at a customer) to the next shipper with an empty trailer. That part of a trip is known as a deadhead. I get paid a basic rate for any miles driven with an empty trailer. What does the appreviation OTR mean? Over the Road— there is no clear cut amount of mileage traveled. Just a way of stating that it is not a delivery driver and that the driver spends the majority of it’s time between metropolitan areas . Can be across the country, from state to state, or from one end of a state to the other end of the same state. If a shipper or customer takes an excessive amount of time to process you, can your company penalize them? Are you compensated? If you have been following me any length of time, you know that customers definitely take their sweet time to load or unload me. The industry “standard” for a customer to have a truck on their property is two hours. In theory, the customer pays a detention fee for every hour they delay a trucker past the two hour window (up to 8 hours – beyond that, the driver is just plain out of luck). I do get detention pay by my company, but it must first be approved by the customer that held me up. Normally, this is not an issue and the customer pays it if I documented the arrival time, appointment time, and the departure times. About 25% of the customers decline paying the detention pay and it can take a whole lot of back and forth business and ultimately the customer wins and the driver loses. Some companies flat out lie about the times and falsely state what time they released me. Again, it is basically an uphill fight and easier to just move on. The longest I have been held by a customer??? 21 hours! Does your company reimburse you for money spent on the road? Generally, no. I pay for all food, parking fees, clothes, etc myself. I also must pay for washing the truck if I want it clean. The company DOES reimburse me for equipment I buy such as headlights, cash fuel, and hotel if my truck is at a dealer for repairs, etc. I know alot of the drivers claim meal allowances and clothes, cleaning supplies, etc as job expenses on their federal taxes. I know certain states allow per diem and others not. I used to get per diem but opted out of it because they get to take an “administrative fee” out of every pay check. I found out and did the math that I could opt out and take NO per diem yet increase my 401K contributions for tax free savings and come out BETTER in the long run with more money in MY pocket! Could you explain how hours of service and hours to drive work? These are the main clocks we have to go by in a nutshell. May not drive after 70 hours on duty in 8 consecutive days. A driver may restart a 8 consecutive day period after taking 34 or more consecutive hours off duty. Why do I hear signal clicks when you’re going up a hill, even though you’re not changing lane? Since I normally haul 75-80,000 pounds on the highways, it can really slow me down going up the mountains and steep hills. Because the regular traffic can maintain the higher speeds, they sometimes do not realize a big truck is going so slow. I usually put my 4 way flashers on about 40-45mph to let others know I am in fact going slow. The same applies to going downhill. When I have 40 tons pushing me down the mountains, I need to go slow enough to maintain control and let the engine brakes do their job so I do not burn up my brakes. Do you listen to music while you are driving ? I cannot listen to music while broadcasting since it results in music copyright issues on the BigRigTravels Channel. I am quite content to think my own thoughts about a wide variety of things anyway. I have been known to throw in a few CDs when we are on the long back stretches with absolutely no signal, especially at night when you can’t see enough to even make recording the views worthwhile. Does your truck have a manual or automatic transmission? The DT12 automated manual transmission (AMT) delivers smooth shift performance, durability, and ease of operation. It combines a traditional clutch-actuated manual gearbox with a computer-controlled shift actuator and clutch, providing optimal power and fuel efficiency. The 2016 Freightliner Cascadia I currently drive gets an average of 8.1mpg over the last 330,000 miles. This includes empty, full, and every type of terrain. Do you use a bat to check your tires, if so how? Actually, no I do not. I know the truckstops all sell them but all that will tell you is if the tire is flat. You should be able to see a flat tire by looking at the ground to tire contact, or looking to see if the tire is seated on the rim snug. If you are looking at the tires that closely, it is just as easy to stick the tire pressure gauge to it and make sure you have the full PSI required to check proper inflation and that you don’t have a small leak. Bobtail simply means I am driving just the tractor with no trailer attached. This happens when I drop a loaded trailer at a customer and they do not have any empty trailers available for me to take back out. If they don’t then I usually bobtail to another customer or dropyard to find an empty trailer. 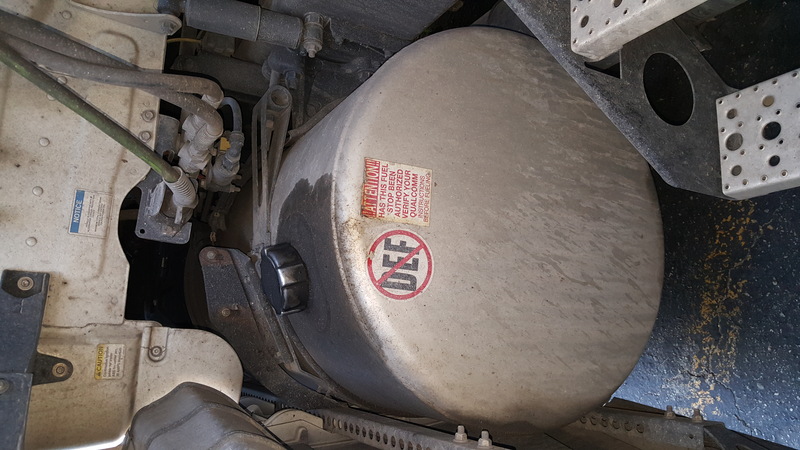 What is the capacity of the truck’s fuel tanks, and of the trailer’s reefer fuel tank? I have two 100 gallon fuel tanks for the tractor, one on each side for a total of 200 gallons. 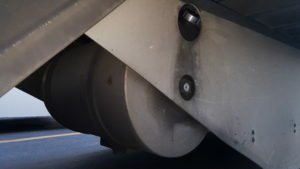 The trailer has either a 50 or 100 gallon fuel tank mounted near the landing gear. The 50 gallons are for standard highway use while the 100 gallon tanks are called rail trailers for use on trailers that get transported long distances on the rail network. Do you have a deer beeper on your truck? No, I do not. I’m not convinced they work, perhaps they do. I myself have never had one on any vehicles. How do you mount the cameras? The cameras are mounted on the windshield using Steelie magnetic balls. This provides remarkable stability while driving yet easily be able to quickly remove the cameras at any time. Mounting on the windshield allows it to be placed below the dash height and provides a wider view of the road. In my case, instead of using the permanent adhesive that comes in the kit, I opted to use double stick heavy duty tape so that I can remove the mounts from both the windshield and phone back if needed. The images below are Amazon referral links to show you where to buy if you choose. The video shows how the mounting works. What cell phone provider do you have? I have multiple services with Verizon. The data alone to broadcast the LIVE stream and GPS driven data from the truck cost me about $350+ a month. What brand of stabilizer did u get for the Segway? I bought and LOVE the SMOVE Stabilizer. It is very well worth the money, built well, fantastic battery life, and basically is a product that actually does do what it promises! I am very satisfied with mine. Here is a link to their webpage. Tell them BigRigTravels sent ya! Who picks out the Sunday morning music video? The Sunday Video selections are picked out by TK each week. That is her contribution to the website and that feature is enjoyed by many folks. How do you prevent overheating of the cameras? Since the camera phones are black and made of glass and sit directly on the windshield, overheating can become an issue. Overheating stops charging, destroys the battery life and of course shuts down the phones and broadcast. I have mine positioned directly above the defrost vent and run the air conditioner to keep them cool. This is why you hear a breeze or rumble noise on the broadcast. During extreme heat the cameras will shutdown if I am stopped for the afternoon or fuel with the engine stopped. Did you used air conditioner in winter weather to cool your phones?